Looking for effective stress management strategies to help you cope? Do you suffer from overwhelming stress? Are the pressures of everyday life taking a toll on you, both emotionally & physically? Are you looking for effective stress management strategies without medication? How much is your stress impacting your health? How have your stress levels affected your relationships? Effective stress management is vital for our psychological, emotional and physical well-being! Stress is a natural psychological and a physical response to feeling threatened, overloaded or challenged beyond the point at which we feel we are able to cope or operate as usual. Physically, the human brain and body responds to stress as a complex array of patterns that occur in our mind and body (via our brain and nervous system); releasing increased hormones, namely cortisol and adrenaline and activating the fight or flight response. This is a normal healthy response to stress which helps us to cope short-term during threatening situations. However, a healthy stress response involves the decrease or calming down of these hormone levels once a threat has dissipated. So in situations of prolonged or chronic stress, the body does not have a chance to recover. The pressures of everyday modern life can be very overwhelming, and whilst everyone experiences stress at certain times, when we are consistently experiencing high levels of stress our physical health and well-being can be greatly compromised; leaving us susceptible to illness, fatigue, sleep disorders, anxiety and depression. It is not just external situations or events which cause stress. One’s perception of how a negative outcome could be, also significantly determines how an individual will experience stress. Stress can be significantly increased when we frequently worry about possible negative outcomes. Two different people may experience a similar situation, however one may feel stressed whilst the other won’t, depending on how they think about it. Constantly worrying about potential negative aspects of situations can also trigger feelings of intense fear, anxiety and panic attacks. Regardless of whether or not the cause of your stress is considered to be significant or not, most importantly it’s the way you deal with stressful situations that affects your overall capacity to live a calm, balanced and fulfilling life. Hence, the levels of stress that individuals can cope with, and the ways in which people respond to stressful situations, varies enormously. Stress management techniques incorporate a number of potential strategies that are designed to help you to cope with both the physical and mental aspects of the stress response. Improved and more functional responses to life stressors can be learnt, as can more helpful ways of thinking, and healthier habits can be put into place. If stress is an ongoing issue for you, perhaps it might be time to consider if you are managing your stress, or if stress is managing you? As a qualified and experienced Psychologist and Hypnotherapist I have developed a unique one-on-one 8 week program that will help you to understand the main external and internal causes of your stress, address your emotional responses to stressful situations, and teach you practical strategies to calm down your body and your mind. Identify your core psychological patterns that influence the way you personally handle stress. Initially we will work with your conscious mind to increase your levels of self-awareness, and to teach you transformational tools to change your thoughts, emotions, and behaviours when feeling stressed. Then we will work with your unconscious mind directly, using powerful techniques like Hypnotherapy, Emotional Freedom Techniques (EFT) and Neuro Linguistic Programming (NLP). 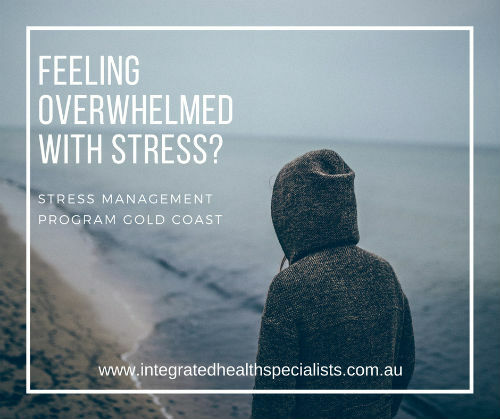 If you have difficulty managing stress or if your life is currently presenting you with more stress than you can deal with, our 8 week program can help you! Reducing your stress and learning to manage your stress better, is essential not only to emotional well-being but also to your physical health.